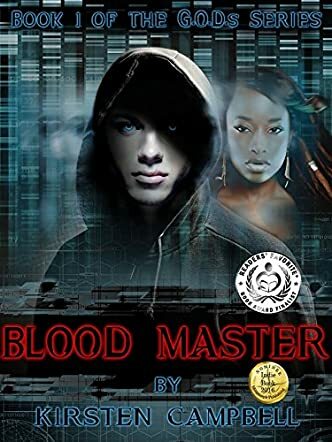 Blood Master: Book 1 of The G.O.D.s Series by Kirsten Campbell is a paranormal fiction story with dystopian and science fiction elements. The story starts in 2052. After a Great War, the Earth’s population was broken into different factions who fight among themselves for food and supplies. One such faction, the Brotherhood, believes in a prophecy that is written in the Master Scrolls Book that an albino man with powers will come to their fortress to rid the world of the Guild Faction and the terrible evil the Guild Faction spreads. But Tassta has never seen an albino. She doesn’t even believe that they exist. Until she meets Griffin Storm. Griffin manipulates crystal and glass. He is a survivor of terrible experiments and is hunted by the Guild, the people that experimented on him, because his powers could change the world. The Guild believe that Griffin can transform into a G.O.D, a Genetically modified Omni-Dimensional creation with untold powers. Tassta believes Griffin is their chance to defeat the Guild once and for all. Blood Master is an interesting story because there is a lot happening that will keep you entertained and thinking about the consequences. I liked Campbell’s idea that a creature modified by the “bad guys” could then gain too much power and help those fighting against the Guild in order to destroy it. It almost seems just, because if the Guild hadn’t been experimenting on people in the first place, they wouldn’t have created the one person who could destroy them. It’s like they are almost getting what they deserve, and I like that idea of justice. Readers will enjoy this story because of the interesting characters and the intriguing plot. Campbell was able to create a solid story line and readers will be itching to get to the book's last pages.